Dhaka, October 04: The Dhaka based Research and Empowerment Organization which is working for Hindu Rohingyas has appealed the global audience and human rights organisations to donate for the refugee Hindu Rohingya families mostly women and children whose husbands and fathers have been slaughtered by the Muslim Rohingya goons. Research and Empowerment Organization is working for Hindu Rohingya. REO is giving food and medical facilities for them. However, REO is working with local people, where they stayed three days with 4 doctors and 19 volunteers to serve the Hindu Rohingya. REO and local people served 1000 people per day for medical facilities and feeding including Muslims Rohingya. Marginalized Hindu Rohingyas are deprived in every aspect in Bangladesh. Even they are not getting relief from government side due to Hindu, this is religious discrimination is going on. Sarkar told NewsBharati that, the Muslim Rohingyas who actually have bullied and massacred the Hindu Rohingya males and now pressurising Hindu women to convert and marry them, are enjoying global attention, sympathy, support and rehabilitation in every possible way; but the Hindu Rohingyas have become a neglected entity by the global Human Rights bodies and the Hindu organisations too. The situation of Hindu Rohingyas is worsening and now for the REO and local supporters, it's becoming unmanageable to handle the daily expenses to feed and sustain a livelihood for the Hindu families. The Prof Chandan Kumar Sarkar has started “DONATE TO SEE HINDU ROHINGYAS ALIVE” campaign and appealed the global Human Rights NGOs, Hindu organisations and individuals to donate generously to see the “Hindu Rohingyas Alive” citing the barbaric attacks on them and the campaign of Muslim Rohingyas to ‘Surrender and convert to Islam’ against Hindu families. There are 532 Rohingya Hindus maximum are female and children, their family men members had been slaughtered. They took shelter in the chicken farm at near Kutupalong Rohingya Camp at Ukhiya, Cox's Bazaar in Bangladesh. 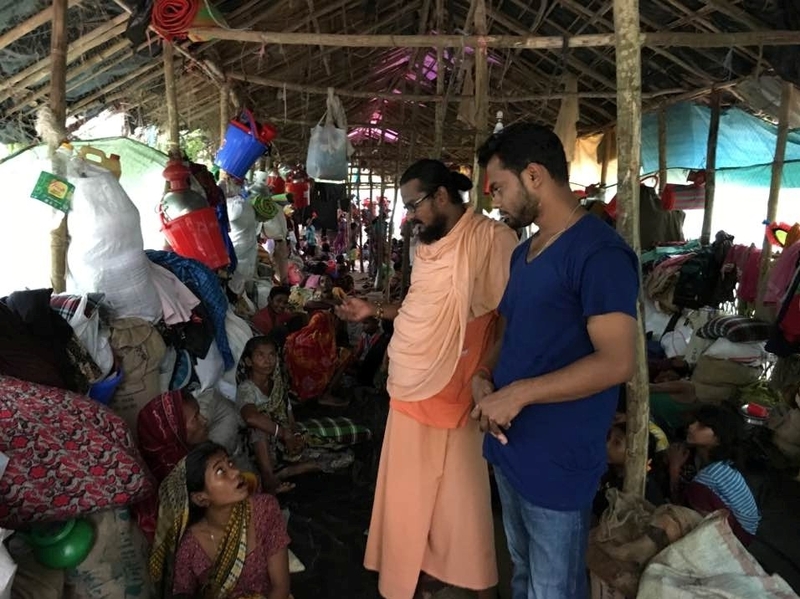 A local Hindu man Jogodish Saha gave shelter to the Hindu Rohingya in his Poultry farm. Rohingya lives have been turned upside down but do you know regards on Hindu Rohingya those who have no one to see their tears. Research and Empowerment Organization is working for them for feeding and giving facilities for surviving. No one is willing to come to save them; even from Bangladesh, 9 Hindu Rohingya had been kidnapped. The Health concerns are rapidly rising as monsoon rains increase the risk of disease. Poor access to clean drinking water and basic health services, in addition to the monsoon rains, means that there is an increased risk of water-borne diseases such as cholera. Such an outbreak could spread rapidly through crowded Chicken Farm where Hindu Rohingya sheltered and informal settlements. We need to scale up basic health services, access to clean water and basic hygiene items. “They shot my husband and laws including everyone in front of eyes. The Mask covered people killed and telling marry us and convert to Islam, I agreed to save my life. They took me into the jungle for 2 days. After this covered man brings me to Bangladesh said, Anika Dhar.